Loons are one of my favorite types of water fowl. They are the state bird of Minnesota and they adorn the critical habitat license plates that are on my car. However loons are built a little bit differently then most other species of birds. First off their legs are further back on their body then most other birds. This makes it very difficult and awkward for them to walk but it does help them to swim. That is why they spend the majority of their time in the water. 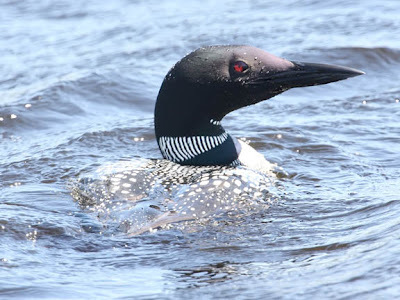 Common loons nest on fresh water lakes in Canada, Alaska and northern portions of the United States. 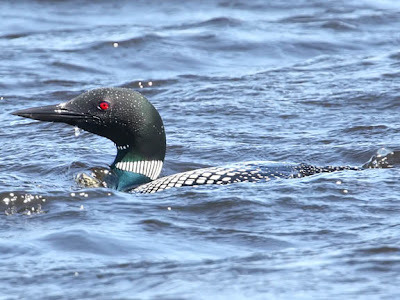 They winter in the coastal waters of the U.S.
You might notice in the pictures above that the loon appears to be sitting very low in the water. That is because while most birds have hollow bones the common loon does not. This adaptation makes them less buoyant which enables them to dive up to 200 feet under the water. Below the surface of the water they prey primarily on fish but they will also eat other aquatic vertebrates and invertebrates. 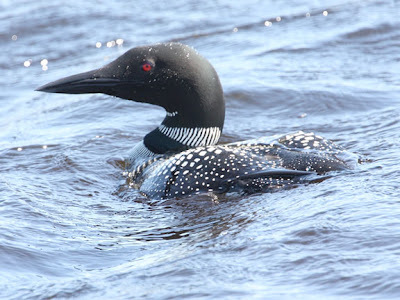 The loon looks very happy to be at a distance from the photographer! Oh, I've always wondered why loons sit so low in the water. For diving purposes! That explains it. Wonderful to know, at long last. There is nothing like the intense darkness of a faraway lake, with the lonely cry of a loon at night. Beautiful pictures and really interesting discussion. I see loons in the reservoir by my house. They are beautiful! I watched and listened to the Loons in the Outer Hebrides recently - lovely. Wish I'd got photos as great as yours. Very informative. Makes me want to spend Canadian coinage.